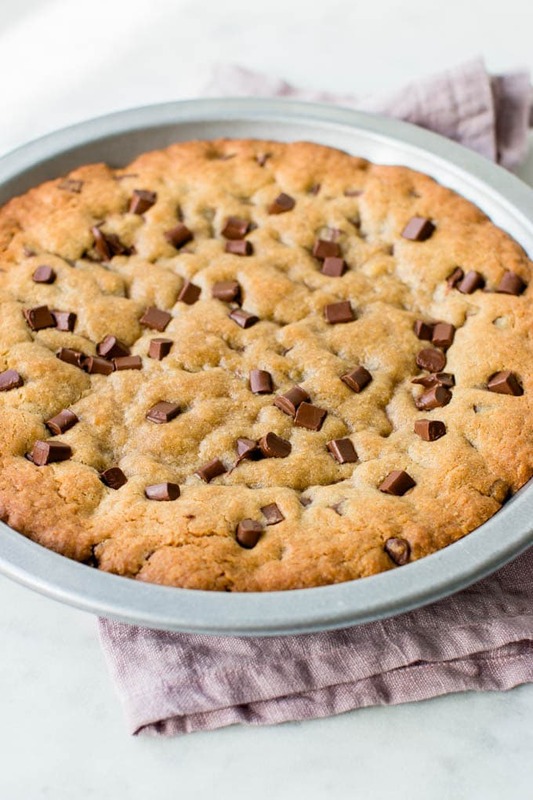 Ultimate Chocolate Chip Cookie Cake (Video) - Pretty. Simple. Sweet. Super soft chocolate chip cookie in cake form! So flavorful and loaded with chocolate chips. My new favorite way to eat a chocolate chip cookie! 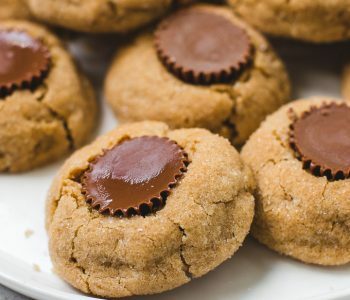 I never understood the hype around chocolate chip cookies until I tried this recipe for soft and chewy cookies and immediately fell in love. I then experimented with many other recipes, and fell in love with this recipe too. 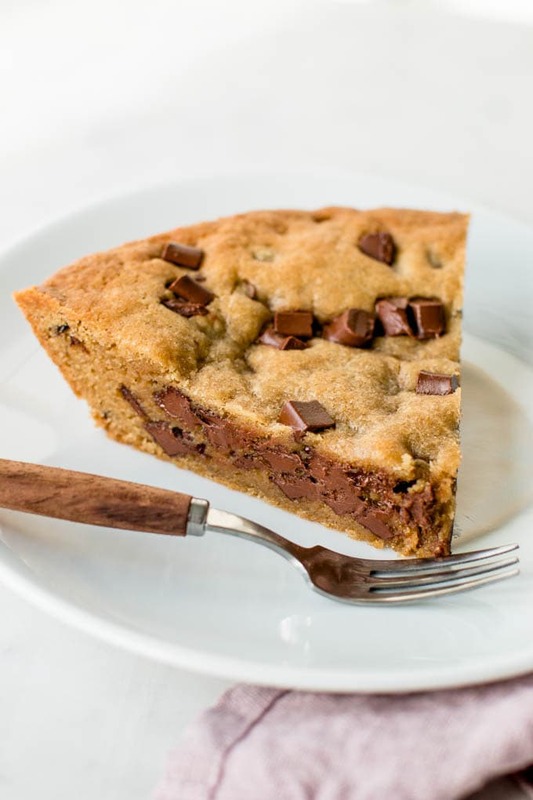 And when I tried this chocolate chip cookie cake recipe, I knew that my relationship with chocolate chip cookies reached a whole new level. It was true love. 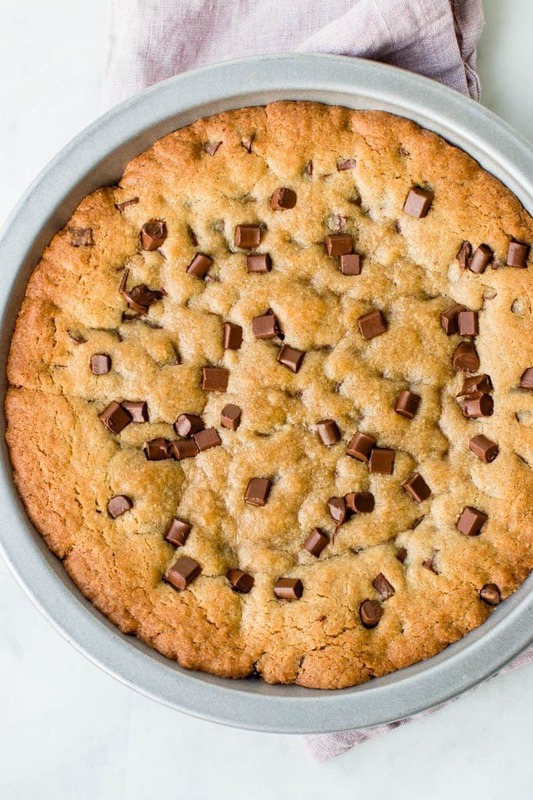 This ridiculously delicious cake is basically a giant cookie baked in a pan. 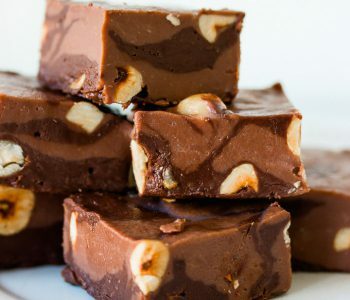 It is then sliced just like a cake, and every bite is soft and chewy and loaded with melty chocolate chips, plus the edges are crunchy so you get the best of both worlds. This cake would be a great choice if you want to make chocolate chip cookies but looking for something that’s a bit more festive. It’s also perfect for sharing, although the moment it was out of my oven, I digged in and ate half the cake myself, so there wasn’t much left for sharing. What Makes This Cake Soft and Chewy? 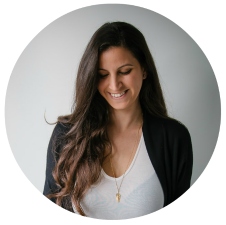 I talk more about cookie science here. 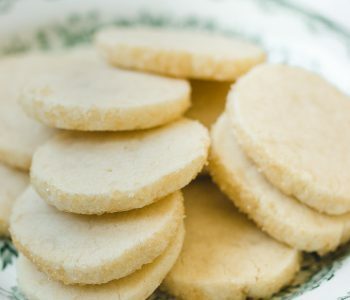 The cake gets its wonderful flavor and texture from (1) brown sugar that adds moisture to the cake (2) adding an extra egg yolk instead of a whole egg (3) adding a bit of cornstarch, which is optional, but it does make the cookie cake ultra soft. Can You Use Melted Butter? In one of my favorite recipes for chocolate chip cookies I use melted butter. I tried this cake both with melted butter, and room temperature butter (that’s creamed with sugar using a mixer), and preferred the latter. It’s more cake-y but in a good way, and the flavor and texture were better. That’s my personal opinion though and you can try it with melted butter if you like. If you do, there’s no need to use a mixer. Mix the melted butter with the sugar, and continue with the recipe as usual, adding eggs and vanilla, and then dry ingredients. I think this cake is so beautiful that most of the time I don’t even decorate it, but if I’m feeling fancy, I serve it with ice cream and drizzle with salted caramel sauce or hot fudge sauce, and today I’m feeling fancy. If you want to make it more festive or turn it into a chocolate chip cookie birthday cake (my friends always ask for it on their birthday), decorate with whipped cream or chocolate frosting around the edge, and top with sprinkles, then put some candles in the center. Preheat oven to 350F/180C degrees. Grease a 9-inch pie dish or cake pan. Set aside. In a medium bowl sift together flour, cornstarch, baking soda and salt. Set aside. 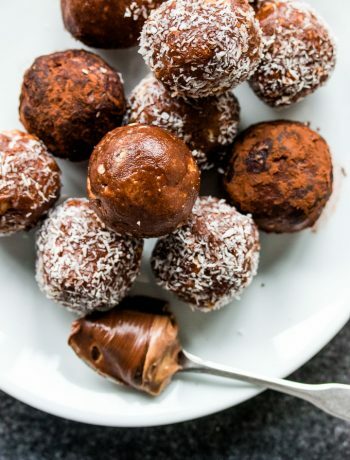 In a mixer bowl fitted with the paddle attachment or with a hand mixer, beat the butter, granulated sugar, and brown sugar on medium speed for about 3 minutes until creamy and fluffy. Add egg and vanilla extract and beat until combined. Add flour mixture and mix just until combined. Do not overmix. Fold in chocolate chips. Press cookie dough into the pan. Bake for 20-25 minutes (mine is ready in 20) until golden brown but still soft at the center, covering it loosely with aluminium foil after 15 minutes so the edges won't brown too much. 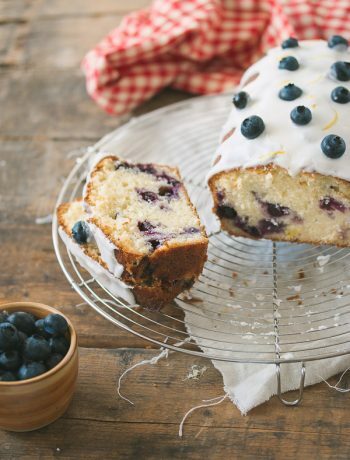 Remove cake from oven and set the pan on a wire rack. Allow to cool completely. 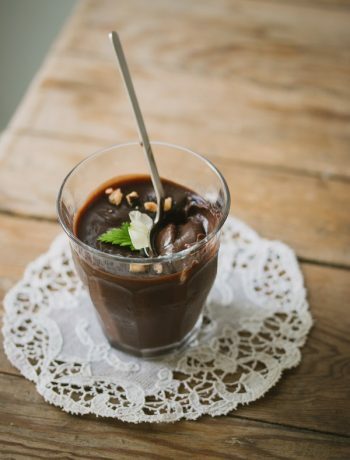 Serve warm or at room temperature, with whipped cream or chocolate frosting, if you like. Cake is best eaten the same day it's made but will keep, covered tightly, for up to 2 days at room temperature or in the fridge. Leftovers can be frozen for up to 2 months. Hi! I found your blog while searching for a recipe for Creme Patisserie (got it…thanks!). In looking further I stumbled across this recipe for the Chocolate Chip Cookie Cake. My bro.-in-law absolutely ADORES Choc. 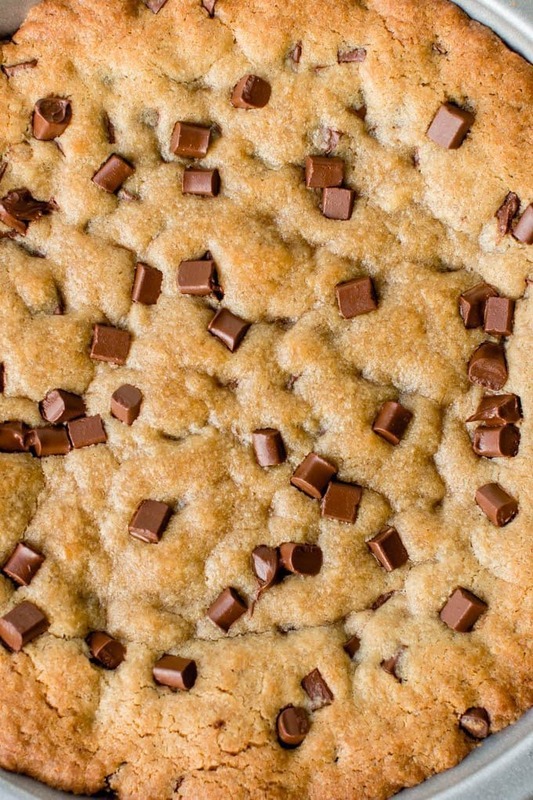 Chip Cookies and his B-day is next month…perfect timing! He also ADORES Brownies. My question is this…do you have any ideas or suggestions on how to turn this cake into a Brookie cake without making a separate cookie cake & pan of brownies & layering them together with frosting? My b-i-l positively HATES frosting! I’ll have to incorporate a little bit of fudge frosting for my sister but not an entire layer’s worth! I look forward to hearing what you have to say. Thanks for your time and consideration! ? Hy Layne, you can make one of my brownie recipes (or your favorite recipe), and pour the brownie batter on top of the cookie dough, and bake it together as one cake. Baking time will be longer, but I can’t tell you exactly how long as I haven’t tried it. 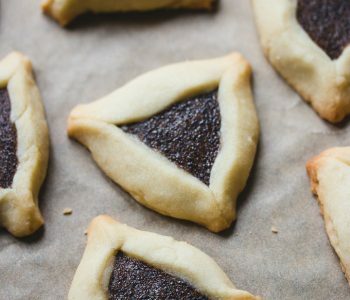 If you’re an experienced baker, you can give this a try! Hi there! Could I make the same amount of cookie dough but bake it in an 8” springform pan? Many thanks for your reply! It’s better to bake it in a shallow pan, but if that’s all you have then you can use it. The cake would be slightly taller, and you’ll need to add a few additional minutes to the baking time. I want to make this for my dauggter’s birthday party for 20 kids. 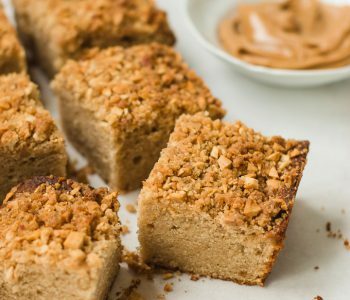 Can I double the recipe and bake in a 9×13 pan? If you want to to adapt recipes for different pan sizes use this guide. This chocolate chip cake is soooo delicious! Best chocolate chip cake I have ever tasted. Thank you so much! Can I substitute oil for the butter here? can i use gluten free flour instead?